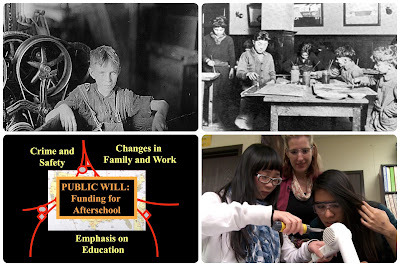 Many years ago, I developed a series of PowerPoint slides on the history of afterschool in America. I included these slides in all of my presentations throughout the country and these slides were the most popular ones I did. After every presentation, young youth workers would approach me and say things like, “I had no idea that I belonged to something that has such a long and important history”. I believe strongly that in order for Afterschool to be considered a field, it is necessary to have a documented history. By “field”, think of medicine, nursing, social work, or education - each has a documented history. Although afterschool youth programs date back to the late 1800s, our history has not been documented fully. To address this, we are launching a project to produce a 1-hour video documentary on the history of afterschool in America. This will be broken into three 20-minute sections suitable for use in staff training. Each section will be accompanied by a brief study guide. These materials will be distributed to afterschool programs across the country at no charge. Interviews and video clips will be conducted by youth videographers that are part of local afterschool programs and youth-led social enterprises. To ensure that we create a quality product, we have assembled a distinguished national advisory group. We are currently raising funds to support this project by reaching out to individuals for small donations. We will also be reaching out to afterschool organizations and philanthropists. Please consider supporting this project by sharing this campaign through your social networks. You can also donate to this project by clicking here or clicking the "Donate Now" button below. If you choose to donate, please share your donation through the social media share buttons.